Why are Heads of Marketing still believing that social media outreach will reach those people most influencing their sales prospects? Where’s the supporting evidence? Whichever figures you follow, social spending by B2B marketing depts. is clearly on the rise. But of all the objectives social outreach can help achieve, there appears to be no proof that it’s influencing sales prospects. This is borne out day after day in our own client work. So why are Heads of Marketing still investing as if that proof exists? What is motivating their thinking? 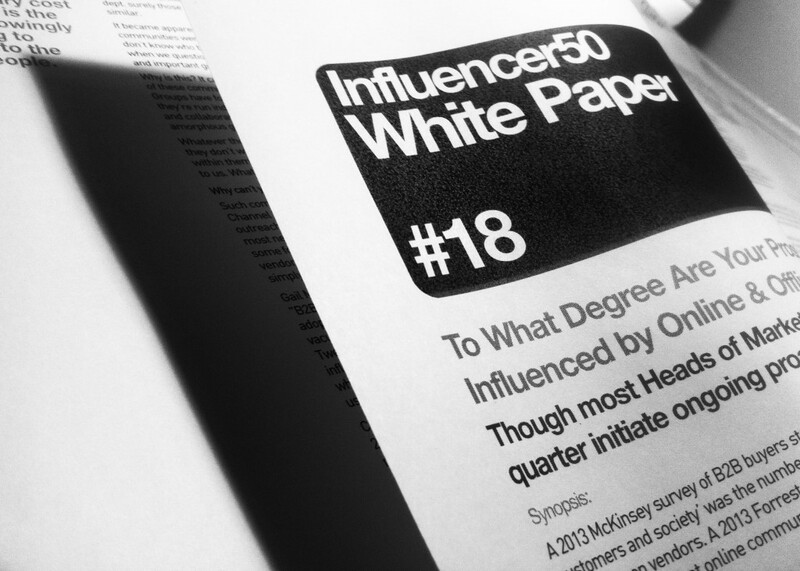 WP#18 – July’14: To What Degree Are Your Prospects & Customers Influenced by Online & Offline Communities? A 2013 McKinsey survey of B2B buyers stated that ‘an honest, open dialogue with customers and society’ was the number one most important perceived attribute of their chosen vendors. A 2013 Forrester report polled thousands of B2B marketers and concluded that online communities were one of the most influential tools in a B2B marketer’s toolkit. Despite 76% of B2B industry marketing heads rating their sector’s main forums and communities (both online & offline) as ‘very important’ in terms of influencing their prospects, only one-quarter of those same vendors are confident their organization has ongoing, proactive relationships with them. There’s clearly a vast gap between the perceived importance of industry communities to potential buyers – and vendors’ understanding of them. So why can this be? 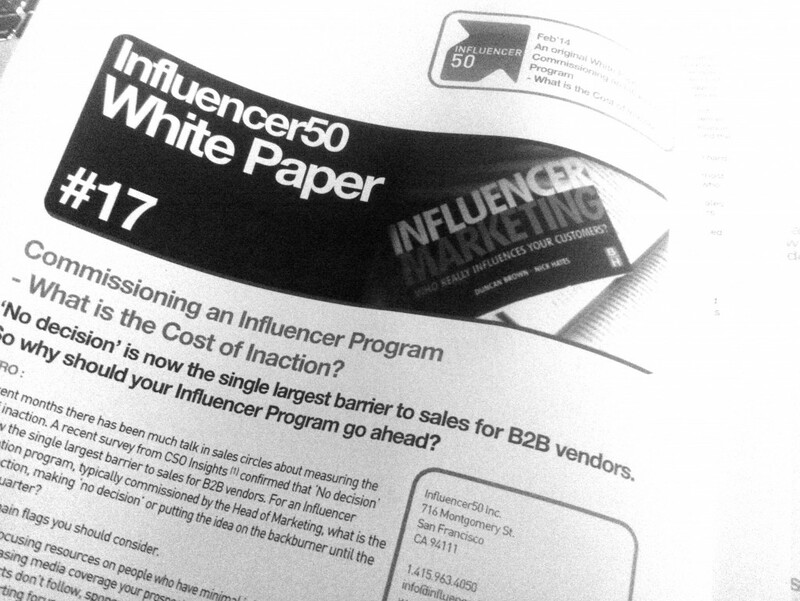 WP#17 – Mar’14: Commissioning an Influencer Program – What is the Cost of Inaction? ‘No decision’ is now the single largest barrier to sales for B2B vendors. So why should your Influencer Program go ahead? In recent months there has been much talk in sales circles about measuring the cost of inaction. A recent survey from CSO Insights (1) confirmed that ‘No decision’ was now the single largest barrier to sales for B2B vendors. For an Influencer Identification program, typically commissioned by the Head of Marketing, what is the cost of inaction, making ‘no decision’ or putting the idea on the backburner until the following quarter? 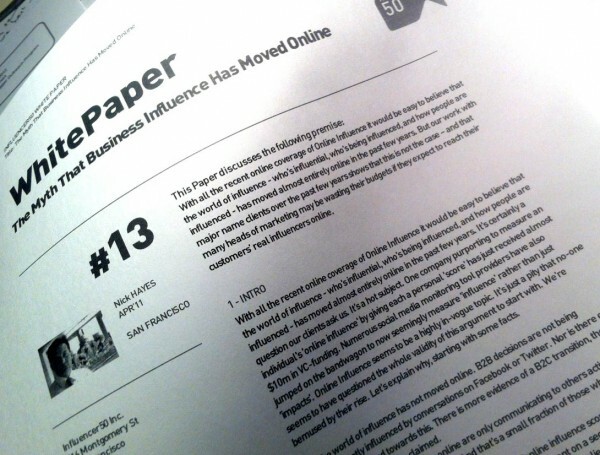 WP#16 – Oct’13: Can you be influential to a market and still remain almost exclusively offline? : How are B2B decisions really being made these days? And is social media involved in the process? Can a market’s ‘influencers’ now be identified simply by trawling through Twitter, Facebook and blogs to see who’s most discussing the subject and with whom? That’s what plenty of ‘influence marketing’ engines would have you believe. Eight years’ dedicated market experience, and all our recent real-world client-side evidence, paints a very different picture. 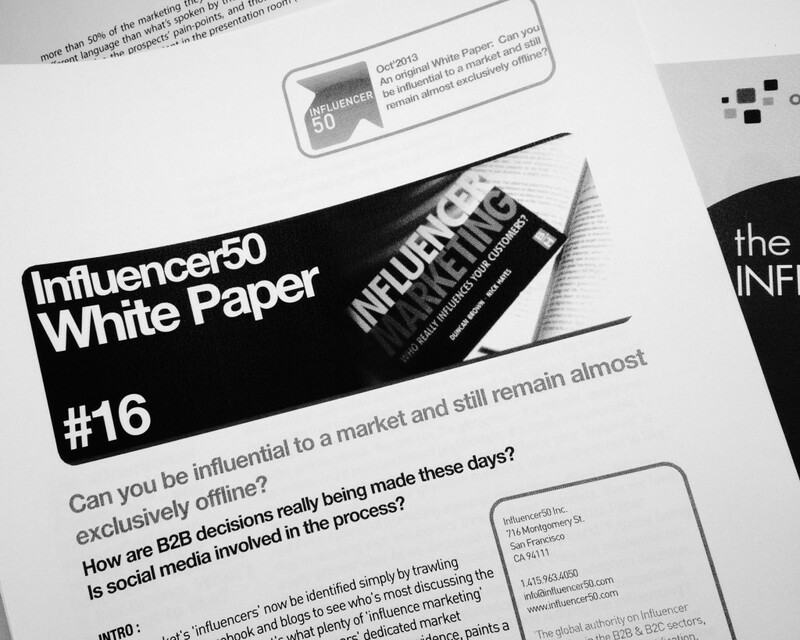 Can you be influential to a market and still remain almost exclusively offline? How are B2B decisions really being made these days? And does social media play a role as the influencers impact those decisions? 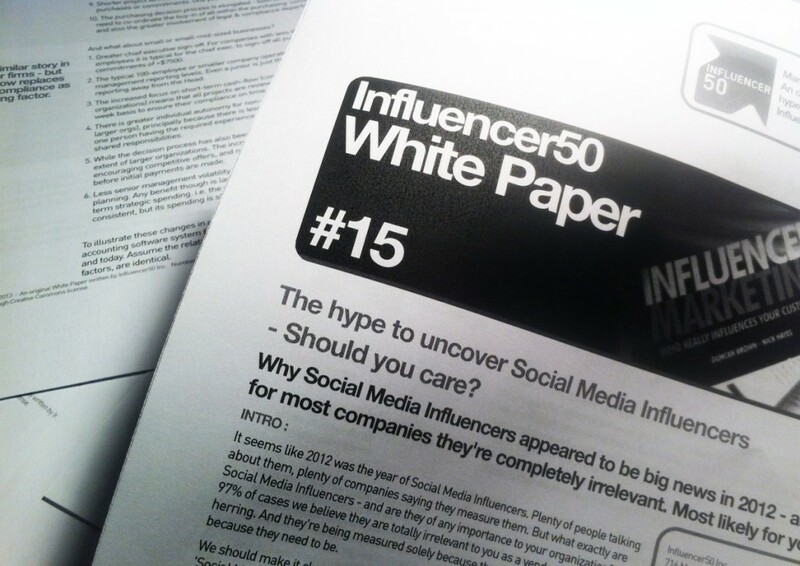 WP#15 – Mar’13: The hype to uncover Social Media Influencers – Should you care? Why Social Media Influencers appeared to be big news in 2012 – and why for most companies they’re completely irrelevant. Most likely for yours too. It seems like 2012 was the year of Social Media Influencers. Plenty of people talking about them, plenty of companies saying they measure them. But what exactly are Social Media Influencers – and are they of any importance to your organization? In 97% of cases we believe they are totally irrelevant to you as a vendor. A complete red herring. And they’re being measured solely because they can be measured – not because they need to be. 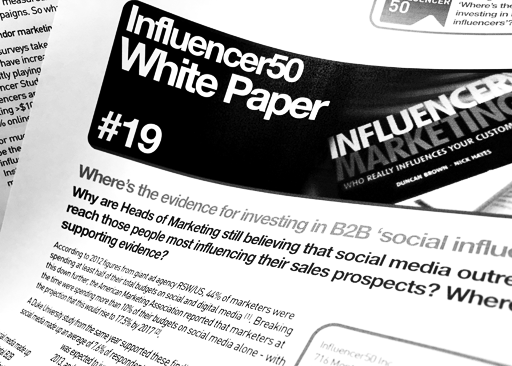 We should make it clear from the outset that this White Paper relates to the role ‘Social Media Influencers’ play in B2B purchase and/or adoption decisions – not merely in creating market noise. Their ability to create noise is undoubted. 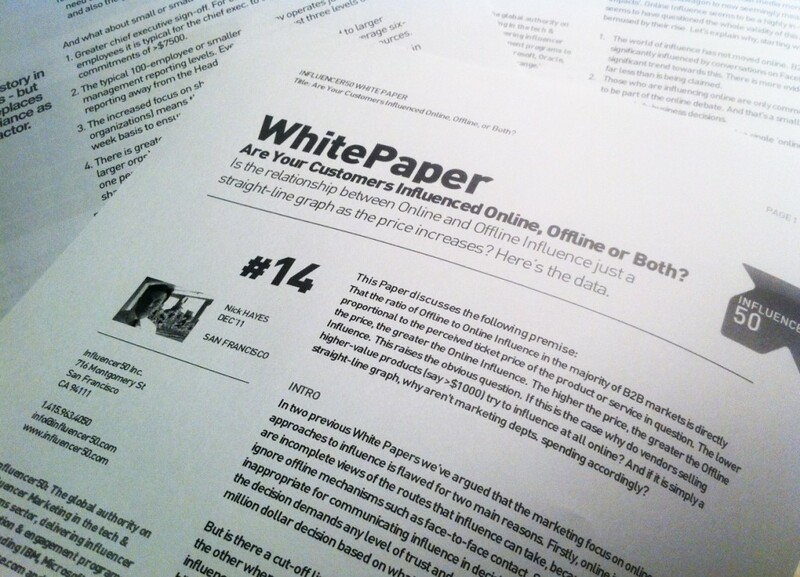 WP#14 – Jan’12: Are Your Customers Influenced Online, Offline or Both? Is the relationship between Online and Offline Influence just a straight-line graph as the price increases? Here’s the data. This Paper discusses the following premise: That the ratio of Offline to Online Influence in the majority of B2B markets is directly proportional to the perceived ticket price of the product or service in question. The lower the price, the greater the Online Influence. The higher the price, the greater the Offline Influence. This raises the obvious question. If this is the case why do vendors selling higher-value products (say >$1000) try to influence at all online? And if it is simply a straight-line graph, why aren’t marketing depts. spending accordingly? This Paper discusses the following premise: With all the recent online coverage of Online Influence it would be easy to believe that the world of influence – who’s influential, who’s being influenced, and how people are influenced – has moved almost entirely online in the past few years. But our work with major name clients over the past few years shows that this is not the case – and that many heads of marketing may be wasting their budgets if they expect to reach their customers’ real influencers online.